Prime Minister Imran Khan said that the ISI is Pakistan’s first line of defence and it stands out as the best intelligence agency in the world. 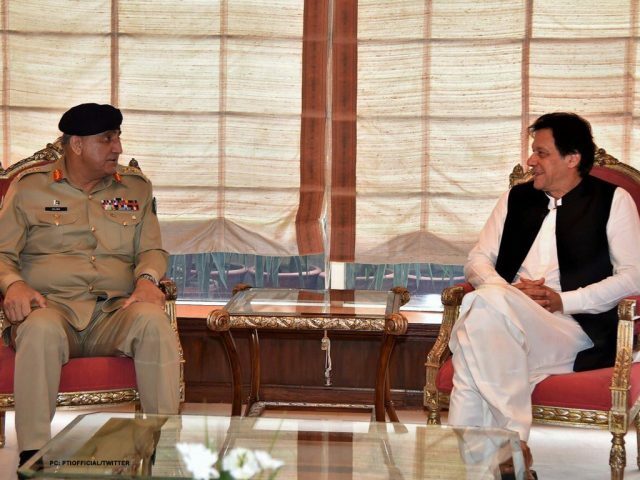 PM Khan along with his cabinet members visited the headquarters of the ISI and was received by army chief General Qamar Javed Bajwa and Lt Gen Naveed Mukhtar, the ISPR said Wednesday. The PM laid floral wreath at Yadgar-e-Shuhada and offered Fateha. The ISPR said that the PM was briefed in detail on various strategic intelligence and national security matters at the premier agency. The PM lauded the contributions of the ISI towards national security especially in the ongoing Counter Terrorism effort. The government and people of Pakistan firmly stand behind their armed forces and intelligence agencies, the PM added.